Andy Reid top scored for Hunts Over 50s. Hunts made it two wins on the spin in the National Over 50s Championship by defeating Beds by 40 runs at Bretton Gate yesterday (May 27). 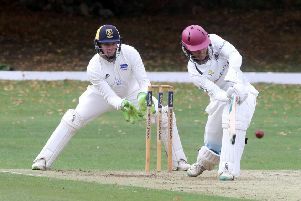 Andy Reid (St Ives) top scored for Hunts with 59, while Nassington pair Gary Scotcher (50) and Mark Finney (39) also scored well as the home side posted 231-9 in their 45 overs. Market Deeping’s Nick Andrews made an unbeaten 27 and then claimed 3-32 from nine overs ad Beds were dismissed for 191 in reply. Steve Tack (Yelling) picked up two wickets. Hunts have won two of their three matches in the East group. They are next in action at Norfolk on June 10. Hunts 231-9 (A. Reid 59, G. Scotcher 50, M. Finney 39, N. Andrews 27no). Beds 191 (N. Andrews 3-32, S. Tack 2-29).